This soup would most likely win the award for cheapest, most climate friendly meal ever – and it’s not lacking nutrients either. To top it all off, it also comes together in 20 min, start to finish, making it a weeknight savior extraordinaire. 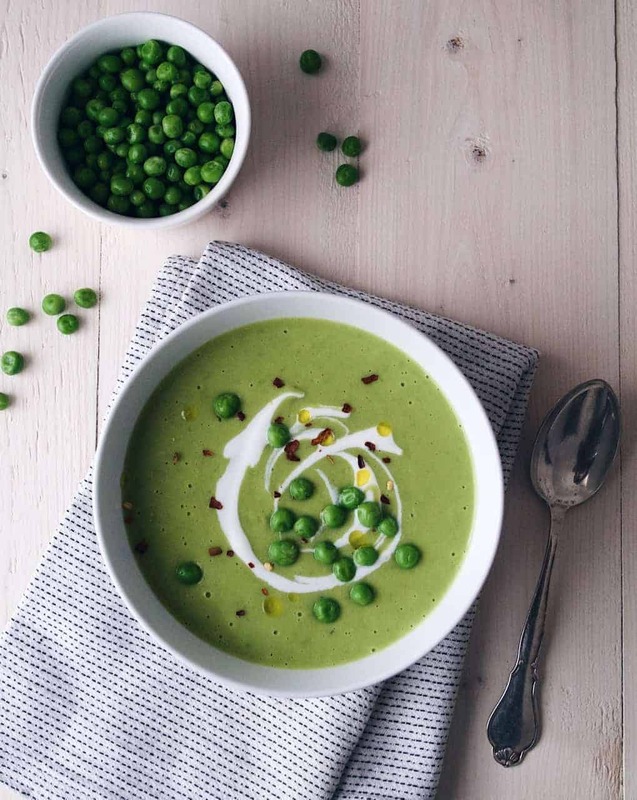 Green peas are great to have on hand in the freezer all throughout the winter for us – besides being versatile in dishes, they’re also very good as a stand alone vegetable side. A quick, filling meal we tend to turn to when time is limited (but hunger is real) is boiled potatoes, green peas and some sort of bean/veggie patty from the freezer. Some sort of dipping sauce added to the mix and we’re satisfied! This soup is a little more sophisticated looking than that, but in the end – the ingredients are about the same. Slow carbohydrates, protein and a whole range of micro nutrients make this a nutritious bowl for sure – and with a slice of bread with hummus on the side, it’s as complete as can be. And yummy. Enjoy! In a medium sized pot, sauté onions in canola oil and 1/2 tsp salt over medium heat for about 5 min, or until softened. Add in potato cubes and allow to cook with the onions for a minute, and then pour in 7 1/2 dl water and stir in the bouillon powder. Cover, bring to a boil, and then lower the heat to maintain a simmer for about 15 min, or until the potatoes are soft. In the meantime, make the “bean cream” by blending oat milk and white beans until perfectly smooth, using either a food processor or hand mixer. When potatoes are done, add in peas, garlic, lemon juice and the bean cream. Blend the soup until smooth, and then stir in a good grind of black pepper. Season to taste with salt (if you’ll need any will depend on the bouillon used), and serve right away.